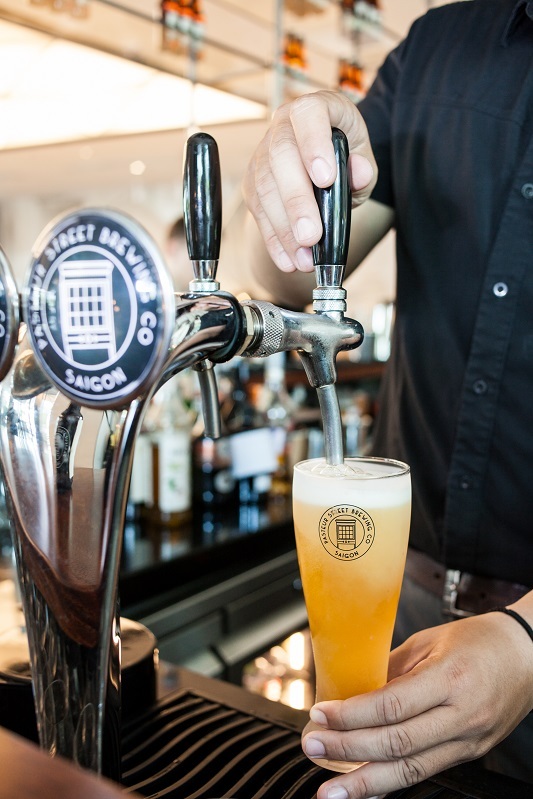 I booked the Craft Beer Brunch at Rbar at the Renaissance Riverside Hotel Saigon (8-15 Ton Duc Thang, D1) as a treat to ourselves at the end of a hard week, hoping beyond hope that it would live up to expectations. Having intermittently tried a few of the Sunday brunches on offer in Saigon, I had got used to the ‘acceptable’ brunch offerings across the city. But the Renaissance have decided to buck the Sunday trend and offer brunch on a Saturday instead, pairing it with the now ubiquitous Pasteur Street craft beers. 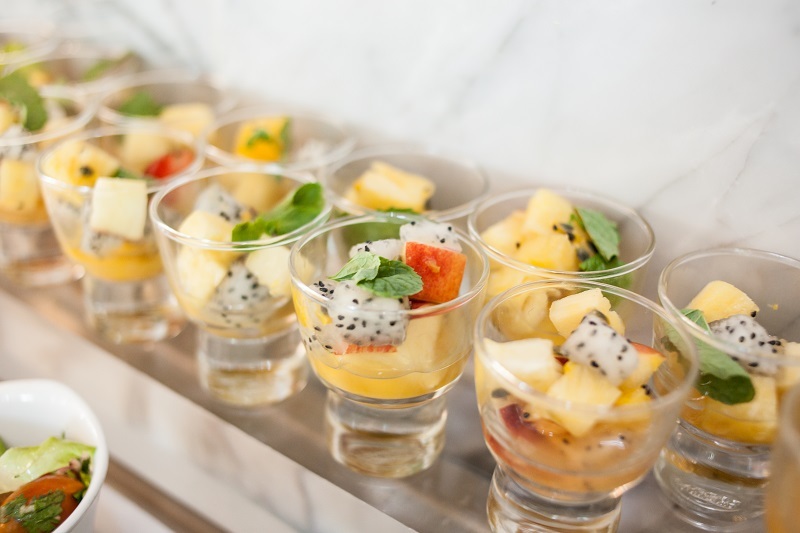 The brunch has been running for just over a year, and was conceived for businessmen and business travelers who still need to work on weekends, but want to do so in a more relaxed atmosphere. The brunch runs in tandem with the midweek craft beer parties they run every Wednesday evening, where the concept, price and food is largely the same, with some variation in the hot-dish menu. As part of the Marriott hotel chain, which operates 160 hotels in 35 countries, the service and décor at Rbar, in the lobby of the Renaissance hotel are what you would expect. Elegant and refined, you could be almost anywhere in the world. Unless, that is, you manage to snag a seat next to the wall-to-ceiling windows which look out onto the hectic frenzy of the Me Linh roundabout at the foot of Hai Ba Trung, overlooked by Tran Hung Dao’s stern statue. There’s a wonderful juxtaposition of the perfect calm inside the bar, with the gentle melodies of the excellent live band washing over you, while Grab drivers scatter pedestrians across the pavement just the other side of the glass. Running from 11:30am – 2:00pm and setting us back VND690,000++ each, we arrived promptly, eager to make the most of the buffet. 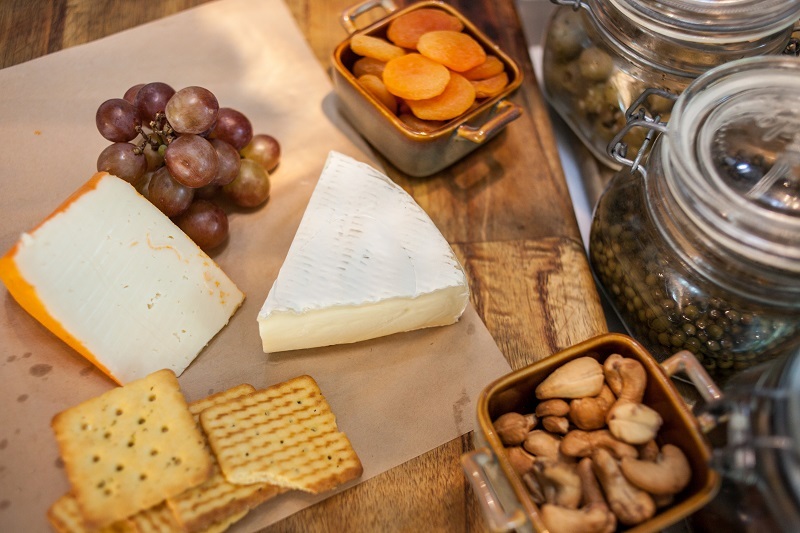 The generously poured, free-flow prosecco & mimosas are a great way to start the morning, accompanying the cheese platter, charcuterie and artisanal breads in a wonderfully French combination. Alongside the buffet there is a great range of hot dishes, all made to order fresh from the kitchen. Picking a brunch classic (eggs benedict) and a local favorite (crispy friend octopus), we also made the move from mimosa to craft beer. 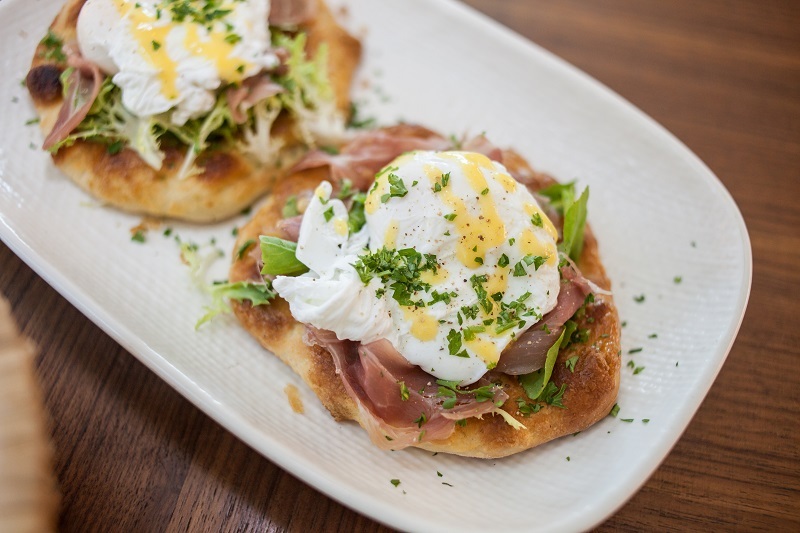 The eggs benedict were poached beautifully—with a firm white and an oozing, creamy yoke. There was no hollandaise sauce, but the bed of rocket was wonderfully tangy and sharp, and the base was a firm, roti-like bread. 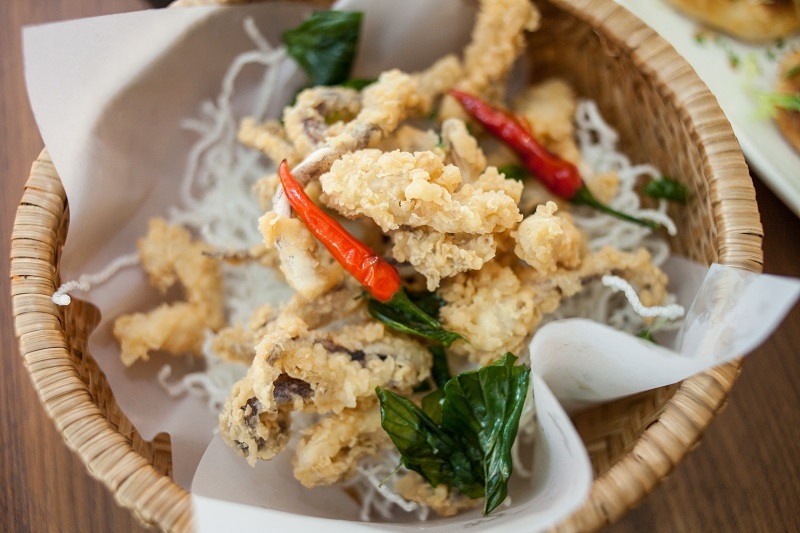 The generous portion of crispy octopus came piled high in a wicker basket, and was tender and crisp. Served with a rich, creamy sauce, there was just a touch of spice. Both of these dished were complemented by Pasteur Street’s predictably good Jasmine IPA, and the lemongrass wheatbeer. The super attentive staff were always on-hand to top up drinks and take hot food orders, but managed to do so without being obtrusive, melting through the other guests to deliver or collect empty plates and glasses. 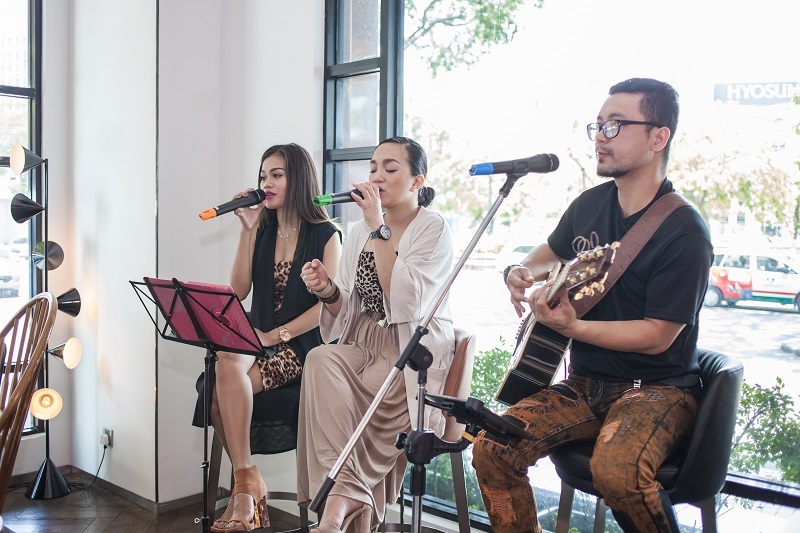 The soundtrack to the morning was provided by a wonderful Filipino trio, whose flawless reproductions spanned lounge classics (think Ratpack), 90s rock (Oasis), and the latest pop. I’d never actually liked a Justin Bieber song until that morning, but their version of Love Yourself was really something else. Ending our gluttonous session with a bang, we gorged ourselves on the cute-as-a-button desserts, which were all miniature versions of summer pudding classics: fruit salad in teeny classes, miniature trifles, pink coconut lamingtons and a platter of crispy-coated chocolate truffles. Accompanied by a strong, tasty coffee, we rolled out of Rbar with not an inch of room left, feeling thoroughly pleased with ourselves. Saturday brunch at RBar is definitely a treat we’ll deserve again, and soon.